Augusta native Mitchell Tarrio finishes second in boys 16-18 division. 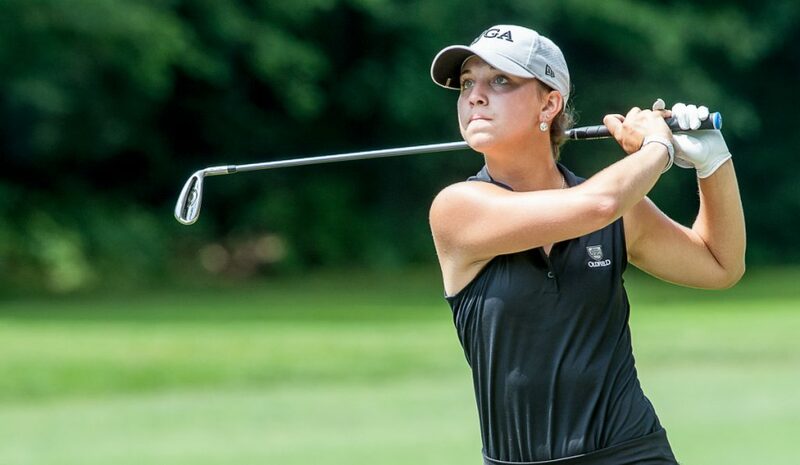 BRUNSWICK — Rachel Smith and Ryan Collins both tore up the second nine holes at Brunswick Golf Club to rally from several strokes back and win Maine Junior Championship titles on Wednesday. Collins, of Cape Elizabeth, made up four strokes and then defeated first-day leader and Augusta native Mitchell Tarrio in the first hole of a sudden-death playoff — after each finished at even par — to win the boys 16-18-year-old title. 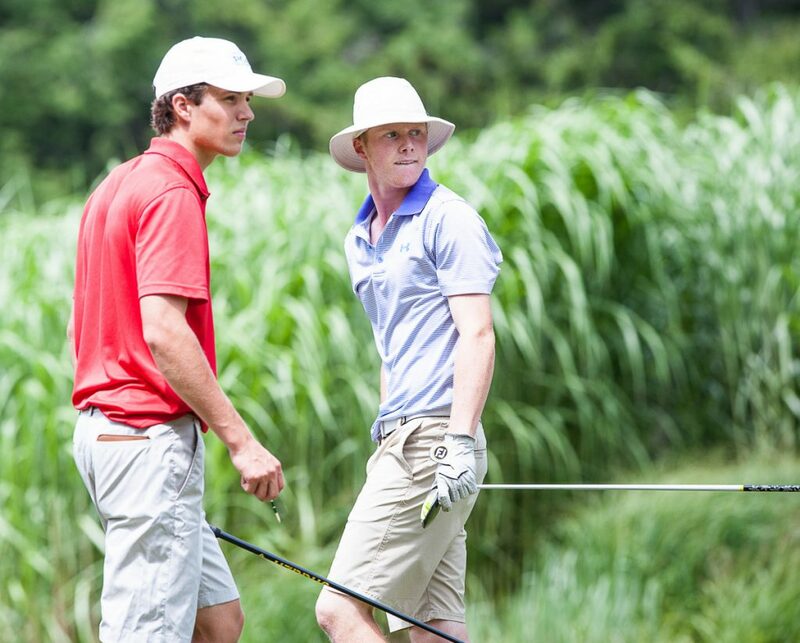 Mitchell Tarrio right watches his tee shot bounce on the fairway as Ryan Collins gets ready to tee up his ball at Brunswick Golf Club on Wednesday during the final round of the Maine Junior Championship. Rachel Smith watches her approach shot on a green at Brunswick Golf Club during the Maine Junior Championship on Wednesday. Smith (4-over) won the girls championship by making up three strokes and edging Jordan Laplume by one. “It was just shocking,” Smith said. Collins and Smith both said they entered the second day of the tournament with little to no expectations of ending it as the winner. Neither went to the scoring table thinking they were going to win. Collins was in the final group with Tarrio and started to wonder if he had a chance midway through the second nine holes (tournaments at Brunswick Golf Club tee off on hole No. 10). Smith played a hole ahead of the lead group, Laplume and Lewiston’s Stephanie Rodrigue. The 17-year-old Smith finished her round at 1-under, including 2-under on the second nine. Her surprise was evident when she heard she finished one stroke better than Laplume. “I didn’t have the mindset to come in and win it all,” Smith said. “I actually didn’t think that I would be able to, Jordan’s such a consistent player. Smith entered Wednesday’s round at 5-over. After two bogeys in the first six holes, she played bogey-free the rest of the round, while recording birdies on the seventh, 13th and 15th holes. Laplume, who entered the day at 2-over, played the solid round that Smith expected. She had 13 pars and a birdie and entered the final hole at 4-over. “I hit the ball good today,” Laplume said. Laplume’s only hiccup came on the final hole, which she bogeyed after her drive put her in a tough spot near a tree and her second shot went in the water. That gave Smith the championship. Rodrigue scored two birdies Wednesday and was even-par on the second nine after going 4-over on the first. She finished the tournament at 8-over to take third. Tarrio started Wednesday at 3-under par. He was still 3-under as he, Collins and Jeremy Baker made the turn. Collins entered the round at 1-over, and after bogeys on the fifth and eighth holes, he was 3-over at the turn, six strokes back of Tarrio. Collins birdied the 10th and 12th holes to cut two strokes of Tarrio’s lead. He made par on the fifth hole, while Tarrio three-putted for a bogey. That’s when Collins said he started to wonder. Tarrio also bogeyed the next two holes, and Collins countered with a par and a birdie to put both players at even par with two holes remaining. Collins lost a stroke with a bogey on 17 after his tee shot went far out of bounds. Collins figured Tarrio would safely play an iron off the 18th tee, which he did. Collins decided to use his driver and aim for the green in two shots, as he had done in Tuesday’s first round. Collins reached the green in two strokes, then two-putted for birdie. Tarrio reached in three and also two-putted for par. Collins thought they were only tied for second, assuming someone in an earlier group broke par. But no other golfer was within three strokes, so Collins and Tarrio headed to the par-4 10th hole for a sudden-death playoff. Tarrio went first, and as he did earlier in the round, hit the ball far left. Earlier, his ball bounced back. This time, though, it was in the woods. Seeing that, Collins decided to play safe and hit an iron off the tee. “I didn’t even take a club out until I saw where his ball went,” Collins said. Tarrio whiffed on his first swing, then hit the ball into the fairway. He settled for a double bogey. Collins scored a par on the playoff hole to win the tournament. Turner’s Mia Hornberger (22-over) won the girls’ 13-15 championship. Portland’s Bennett Berg (12-over) won that age group for the boys. Pittsfield’s Owen Moore (7-over on nine holes) claimed the 12-and-under title.